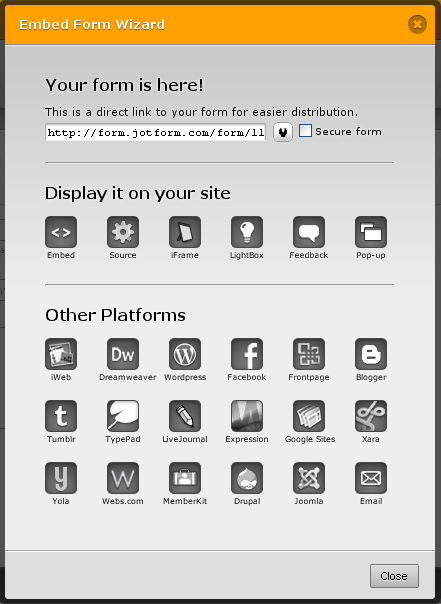 I run multiple jotforms forms on my teaching website. If you click on the link above and go to the "Warmup" form, the dropbox feature is a bit buggy. I use the dropbox feature on all of my forms but it is only the "Warmup" for that is acting weird. The weirdness is the same thing that happened when you guys first adding this great option! I have four dropboxs in one form, but when you click on the next dropbox, the previous dropbox completely disappears. I've tried changing templates to no avail. I thought maybe there might have been some leftover bug that might have been still attached to a certain template you guys have on the site. I've tried testing your form in JotForm's form builder preview, and in contrary from what is seen on your website, it seems fine. Thus, there might have been a code or script conflict from your site to the form's embedded code. I suggest you use iFrame embedding method instead and see if it solves the problem. Hope this helps. Please post updates or any changes for us to further assist you with your issue. Your response will be highly appreciated. Thank you. Sorry about that, I meant "Form Collapse." Anyways, I've tried that exact same form on my work computer and home computer and they are both acting weird. It appears that you have used a service like Hivelogic's Enkoder to hide the code that was provided by the Embed Form Wizard. Whichever embed code was used, try adding ?nojump to the end of the URL section (as explained by Serkan here) and let us know if that solves the problem. That little piece of code worked perfectly! It fixed the problem. You peeps rock! Glad to hear a colleague was able to offer a working solution to your issue. If you have other issues that need attention, kindly let us know. Our support team members are eager and willing to lend assistance whenever needed.